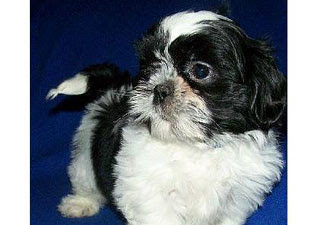 Breed Group: Toy Height: 8 - 11 inches Color(s): Any Coat: The Shih Tzu has a long, dense, and abundant double-coat. The luxurious and profuse outer-coat often sweeps the ground, and may be slightly wavy. The under-coat is wooly and soft in texture. The long hair on top of the head is typically placed into a topknot to prevent eye irritation. The Shih Tzu coat varies widely in color. They are minimal shedders and are considered hypoallergenic. Distinct feature: The Shih Tzu is small, sturdy, and intelligent. They carry themselves with a noble and proud posture befitting their aristocratic ancestry. One of their most valued characteristics is the eye, which exude warmth and a human-like quality. The Shih Tzu is the least delicate of the toy breeds. Temperament: The Shih Tzu is first and foremost a companion. They love nothing more than being indoors with their family. This breed gets along very well with older children and other pets. They are outgoing and self-assured, keen and alert. They make excellent watchdogs. They do not do well being separated from their owners and may become destructive if left alone for extended periods of time. They are docile and quiet, but they also love to play. The Shih Tzu is spunky and can be obstinate at times. They expect to be treated as royalty and are easily spoiled. Activity: The Shih Tzu enjoys short daily walks or vigorous indoor play sessions and games. They are very well suited for apartment or condominium dwelling. However, they love to play outside, so a small fenced yard is ideal.